WikiLeaks: What if a President Hillary Clinton attempted to blame foreign powers for personal scandals? WikiLeaks founder Julian Assange said there is “no proof whatsoever” that Russia is behind the hacking of DNC emails and that Democrats’ accusations are merely a “diversion” by Hillary Clinton’s campaign. The response to the DNC leaks by team Clinton “raises questions about the natural instincts of Clinton that when confronted with a serious domestic political scandal, she tries to blame the Russians, blame the Chinese, et cetera,” Assange said. “We have not disclosed our source, and of course, this is a diversion that’s being pushed by the Hillary Clinton campaign. That’s a meta-story. 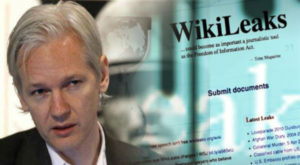 The real story is what these emails contain and they show collusion,” Assange said on July 25. The leaked emails showed efforts within the Democratic National Committee to derail the campaign of Sen. Bernie Sanders. Assange told CNN on July 26 that WikiLeaks might release “a lot more material” that could be damaging to Clinton and the Democrats. Russia has called allegations it is behind the hacking “absurd,” calling suggestions it ordered the release of the emails to influence American politics the “usual fun and games” of the U.S. election campaigns. “This is not really good for bilateral relations,” Kremlin spokesman Dmitry Peskov said.